The escalation over downed Syria jet. An F/A-18E Super Hornet launches from the USS Dwight D. Eisenhower in June 2016. 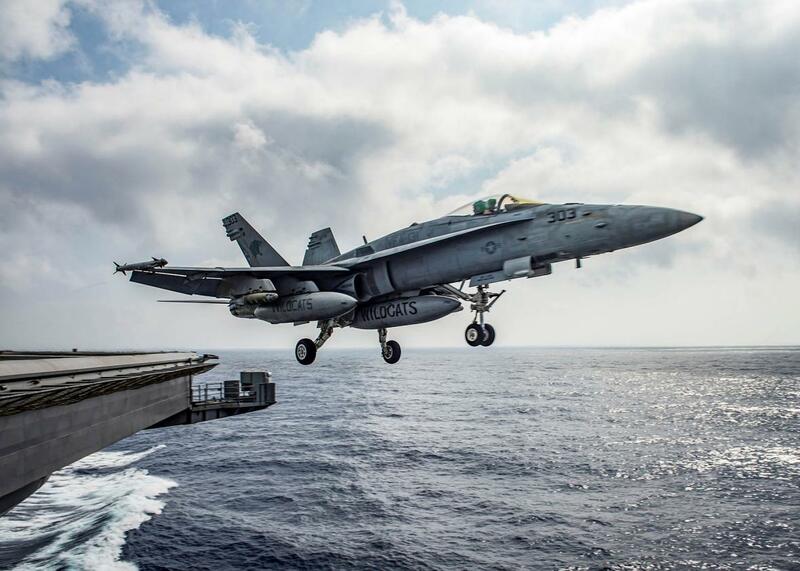 A Super Hornet shot down a Syrian warplane on Sunday. Earlier this month, President Trump decided to let Secretary of Defense (and retired four-star general) James Mattis set U.S. military policy in Afghanistan. Now he seems to be handing the military the same carte blanche on the more fraught battlefields in Syria. The U.S. shootdown of a Syrian jet fighter on Sunday was a move apparently decided by commanders in the field—not the same abdication of duty as Trump’s sloughing off Afghanistan. Pentagon spokesmen say that long-standing rules of engagement allow for “collective self-defense” to protect allied forces on the ground in Syria. A Syrian Su-22 jet had dropped ordnance on the Syrian Democratic Forces, an Arab–Kurdish militia that the U.S. military supports in the fight against ISIS. So a U.S. F/A-18 shot down the Syrian jet. However, just because the military has the authority to take certain actions, that doesn’t mean it should take those actions, especially when doing so takes a tense conflict up a notch. Sunday’s exchange does, after all, mark the first time in this six-year civil war that a Syrian jet fired on this particular U.S.-backed militia and the first time that a U.S. unit shot down a Syrian jet—thus marking an escalation in the fighting and in America’s involvement. Most presidents would have wanted to think through the next few steps before setting a course of action in response to the Syrian attack. But not this president. A former senior White House official told me, “Obama would have had three NSC meetings on this by now” (we spoke around noon on Monday). Many military officers disparaged Obama for “micro-managing” conflicts. Sometimes they had a point; sometimes they just didn’t like it when a president took his role as commander in chief so seriously. This latest confrontation between American and Syrian air forces stands as a case in point of why presidents sometimes should—even must—step in to the decision-making process. The proper response to the Syrian strafing isn’t a tactical issue or a routine step spelled out in a military field manual. It’s a matter of strategy, of high policy, requiring the decision of the highest policymakers. Since the exchange of fire, Moscow has suspended the hotline arrangement by which Russian and American officers exchange information on where in Syrian airspace their planes will be flying (if only to prevent them from crashing into one another). The Russians canceled this arrangement once before, after Trump fired 59 cruise missiles at a Syrian airbase in response to Syria’s use of chemical weapons, but they swiftly and quietly put the arrangement back in place. Perhaps more serious, Russian officials also announced today that they will now treat any U.S. combat plane flying in Syrian airspace as an aggressor against Bashar al-Assad’s regime and, therefore, against Russian interests. Beyond these gestures, it’s unclear what happens next. One uncertainty involves Trump himself. His advisers are divided on whether to beef up or wind down America’s involvement in Syria; and within the hawkish faction, there are divisions on whether to restrict the fight to ISIS, take more active steps to oust Assad, or do more to contain Iran. During the 2016 election campaign, Trump derided those who wanted to oust Assad, arguing that ISIS was the enemy and that weakening the regime in Damascus could strengthen ISIS. Assad was also “a bad guy,” Trump often said, but it was silly to fight him and ISIS at once. And yet here we are, fighting ISIS and Assad at once—to what end, and in tandem with what broader political efforts or goals? It’s a particularly delicate time for the United States to lack a basic strategy. As ISIS is on the verge of losing Mosul and Raqqa—once its former strong points in Iraq and Syria, respectively—the next phase of the region’s civil war will likely focus on redrawing the boundaries between the two countries. This phase could be even bloodier than the last, as it will determine who controls the land and its economic resources—in short, who wins the political struggles that have undergirded not only the current civil war but myriad wars in the region for decades, arguably for centuries. What are the United States’ interests in the region? Where we do we want to see this conflict pan out? Who should get what, who should determine who gets what, and how should any of these decisions be made? What should we do to facilitate this process? Or should we just leave and let the local powers work things out? These are issues of statecraft, which U.S. commanders on the ground or even retired four-star generals running the Pentagon are not trained to make and, under the Constitution, are not supposed to make. These are the kinds of looming crises that led many observers, of all political stripes, to warn many months ago that Donald Trump has no business being president.